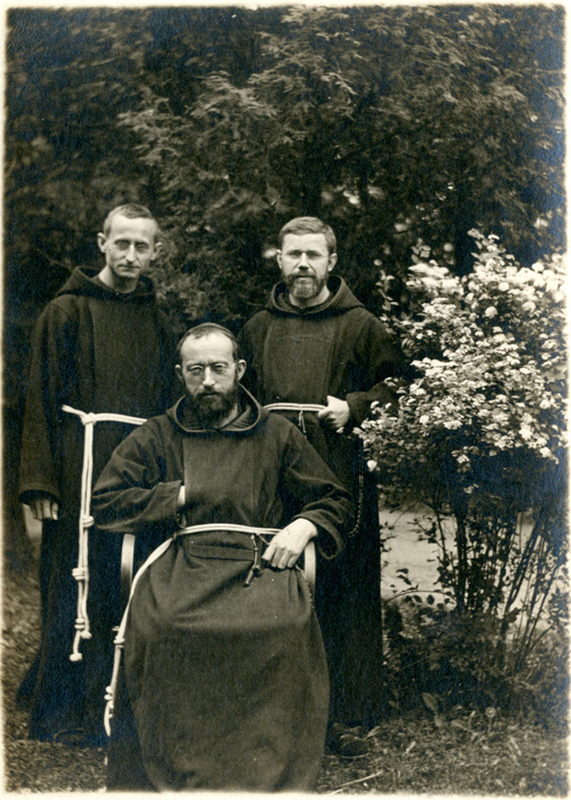 Brother Crucible (seated) and his two companions had come to Agincourt in the early 1920s. This photo was taken in my great-grandmother’s garden. The brothers were staying in great uncle Anson’s old apartment above the stable [a typical ecumenical gesture for a woman whose religiosity, for her generation, was demonstrably small-C catholic], humble quarters convenient to the three Agincourt projects they’d come to build. Before taking vows, Brian Havergal Armitage of Wilkes-Barre, Pennsylvania, had been an undergraduate student of architecture but found the prospects of professional life dispiriting. “The people who need architectural service aren’t always the one who can afford it,” he told his host Martha Tennant in a decade that anticipated the starchitecture we know today. So he left school, apprenticed as a carpenter, and joined the Franciscans, to bring building skills to a different audience. Crucible recruited Brothers Andrew and Jerome and approached their Abbot with the idea of a constructional swat team, to serve the diocese in a pilot program. But sixteen months into their new calling—repairing God’s foundations and fascias—their reputation spread beyond central Pennsylvania; invitations came from New York and Indiana. Then came their ecumenical moment: Father Farber at St Ahab’s and his Episcopal counterpart Chilton Fanning Dowd pitched a three-part project to the Building Brothers. Agincourt’s Roman and Anglican church buildings have ignored each other on East Agincourt Avenue for decades. Happily, their resident clergy have often been on far friendlier terms than their upper administrations: covering for one another; performing baptisms and weddings long before the Spirit of Vatican II took hold; even their choirs shared voices, regardless whether the hymns were unfamiliar. But the Fathers Farber and Dowd were aging, and building maintenance is a problem at the best of times. So matters of rotting window frames, leaking roofs and such were beautifully resolved with a visit by the Property Brothers. Martha Tennant offered shelter in her stable loft and Mrs Breen fed them at Saint Ahab’s. On the job, you’d never guess they were in vocation; the three resembled any tradesman of the 1920s: spacious canvas pants and blue-stripped cotton shirts made from mattress ticking; worn brown boots and tool belts from the 19th century. And after work and dinner, a discreet beer—whose origins were less clear than the beverage itself—finished the day. Once the brothers broke the rhythm of construction, helping the Schutz family harvest their corn. And their last day in town—a Sunday—involved a barn dance and picnic, where we learned that Brother Andrew fiddled a respectable toe tapper. Such were the ways of Agincourt ninety years ago, and such may be their ways again, if we play our cards right. By agincourtiowa in A few figs from thistles, Ghosts of Christmas Past, Uncategorized on Sunday/16/August/2015 .